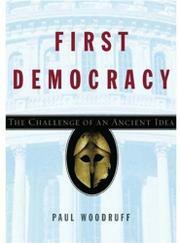 A treatise on the roots of democracy, mixed with a few prescriptions for what the author believes to be ailing US politics today. Woodruff (Philosophy/Univ. of Texas, Austin; Reverence, 2001) catalogues the crucial factors that allowed Athens to develop a thriving democracy from around 500 to 300 BC. Most of those factors involve the state treating equally everyone designated as a citizen, while each citizen, whether rich or poor, tended to be educated and culturally homogenous enough to agree on decisions about how he wanted the state to behave. Much of this nuts-and-bolts history offers a fascinating lesson in civics. Legislation and important decisions in Athens were made by the first 6,000 men who showed up on a hill where the assembly traditionally met, but the topics discussed there first had to be vetted by a ruling council that was democratic because its members were determined by lottery. The system usually curbed mob rule, but sometimes the majority acted as a tyrant, forcing through such poor decisions as the failed invasion of Syracuse in Sicily. The system also checked, but was constantly dogged by, class warfare. Aristocrats often plotted to end a government that gave poor citizens as many rights as they had. The author subtly compares Athens to the United States, the implication being that current officials regularly undermine American democracy. Like the US, Athens was an influential state that sometimes had to act tyrannically to protect its far-flung interests abroad. Unlike the US, however, Athenian citizens had more of a hand in making day-to-day political decisions, rather than ceding decision-making to elected officials who received a majority of votes every few years. Some of these critical comparisons are too subtle; readers occasionally may wish Woodruff would simply spit out his charges. He’s more explicit at the book’s conclusion, laying out reforms he feels would bring the US in line with the ancients’ democracy. An enlightening reminder of lofty—and, alas, elusive—ideals.